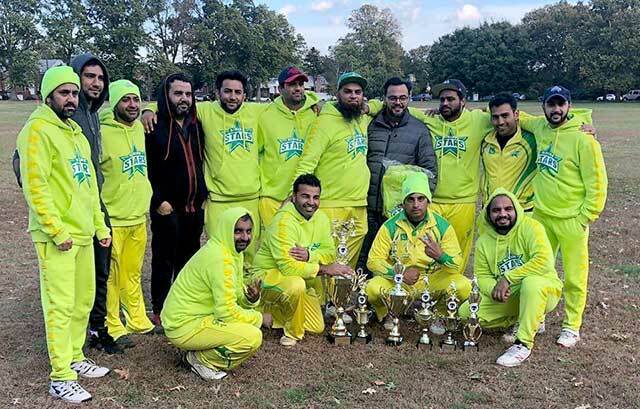 Rising Stars are Brooklyn Cricket League T20 champions after defeating Imperial in the final. On October 20th at Marine Park, Rising Stars posted 199 for 9 from 20 overs. Among the runs were Qasim Ghumman 45, Zameer Ahkter 45, Waseem Hussain 23, Nabeel Bhatia 22, and Mubassa Nadvi 21 not out. Bowling for Imperial, Marvin Darlington 3/0/22/2, Sheldon Burasingh 4/0/29/2 and Tanvir Sami 4/0/45/2. Imperial 193 for 9 from 20 overs, Marvin Darlington 62, Ashkin Eiko 55 and Tanvir Sami 33. Bowling for Rising Stars, Haroon Rehman 4/0/27/3 and Nabeel Bhatia 4/0/31/2. Rising Stars winning by 6 runs. Clermont 233 For 4, Raj Persaud 100, Bhim George 47, Kris Harrichan 45. Bowling for Orange County, Vick Arjune 7/1/43/2. Orange County 62 all out, David Smit 16. Bowling for Clermont, George Bhim 4/1/4/4, Kamal Dutt 7/1/24/2, Kavir Basile 5/0/18/2. Clermont winning by 171 runs. Winter Haven Warriors 118 for 7, Tony Ramlogan 38, Patrick Polarchy 21, Michael Mootoosammy 21. Bowling for Just In Case CC, Kamroy Barifer 6.1/0/19/2 and Allan Hawthorne 4/0/13/2. Just In Case Cricket Club 119 for 6, Andrew Swanson 42, Leroy Houghton 17. Bowling for Winter Haven Warrior Charlie Armagan 7/0/19/2. Just In Case Cricket Club won by 4 wickets. Islanders Cricket Club 140 all out, Vernon Boswell 24, Timroy Allen 21, lary Charlery 5.2/0/24/3. Bowling for Orlando CC, Adrian Thompson 7/0/22/3. Orlando Cricket Club 105 all out, Donald Charlie 38, M. Bharat 7/0/16/3. Bowling for Islander CC, Sunil Deopersaud 7/0/18/3. Islanders CC won by 35 runs.